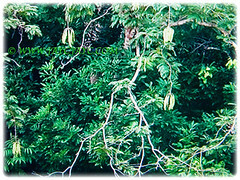 Bitter Bean or Stink Bean is found naturally growing wild in undisturbed lowland rainforest and often cultivated in Malay kampongs. In Malaysia, the Orang Asli will harvest the Stink Beans and sell them for a handsome profit. Prices for the Stink Bean fluctuates depending on demand and supply, increasing sharply in times of scarcity. Botanical Name: Parkia speciosa (syn. : Parkia macrocarpa, Parkia harbesonii). 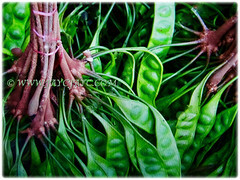 Common Names: Bitter Bean, Twisted Cluster Bean, Stink Bean, Petai in Malay. Etymology: The genus Parkia is commemorates Mungo Park, a Scottish explorer. The specific epithet speciosa in Latin means handsome, in reference to the appearance of the tree when mature. Origin:Native to Malaysia, Singapore, Borneo, Indonesia, South Thailand and Palawan in the Philippines. Occasionally, it is cultivated but rarely outside its native area. Plant type: An ornamental, perennial and fruit-bearing tree. Features: Parkia speciosa is from the genus Parkia that comprises of about 35 species. A slow-growing umbrella-shaped tree that can reach between 30-45 m tall. Domesticated trees take up to 7 years to reach maturity. Its 1 m diameter trunk is covered with smooth reddish-brown bark and branches minutely covered with fine short hairs. Sometimes it can form 150 cm tall buttresses. Leaves are alternate, stalked, bipinnate compound that are 11-45 cm long. The leaves have 11-25 pairs of side-stalk and each has 18-42 pairs of leaflets. 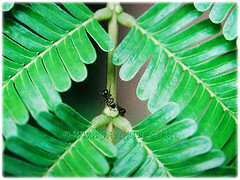 The leaflets are oblong, measuring 3-12 by 1-3 mm. 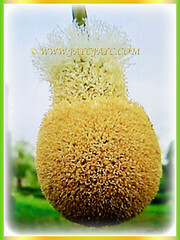 Inflorescence is a pear-shaped pendulous head, 2-5 cm in diameter and peduncle 20-45 cm long. The bisexual flowers are numerous and tiny, light yellow in colour. Male or asexual at the base of the head and bisexual at the apex of the head. The flowers secrete a nectar that attracts bats and other pollinators. When the tiny flowers mature and die, they will be followed by long, twisted and translucent pods that emerge in a cluster of seven or eight pods. These pods are borne on the crowns of tall trees. 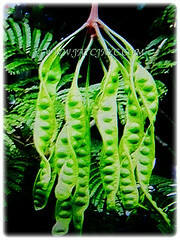 When the pods are mature, within them will reside the edible beans with bright green seeds. 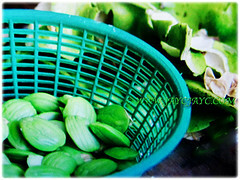 Petai has earned its common name, Stink Bean because its strong smell is very pervasive. It lingers in the mouth and body. 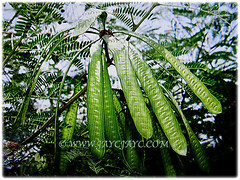 Fruits are long, straight or strongly twisted pods that are up to 51 by 6.4 cm and green. Each pod contains 12-18 seeds. Seeds are broadly ovoid, 2-2.5 cm × 1.5-2 cm, horizontal in the pod with very thin and white testa. Like asparagus, it contains certain amino acids that give a strong smell to one’s urine. It takes 60-70 days from flowering to harvesting the ripe pods. 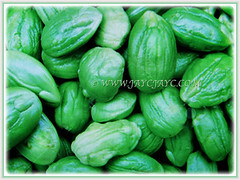 Culture (Care): Parkia speciosa or Stink Bean can be grown easily with least maintenance. Moisture: Moderate water requirements. It is drought-tolerant once well established. Soil: Loamy or clay-loam and well-drained soils. It’s also able to grow in waterlogged soils. Others: This beauty requires ample space and light to grow, though some shade is required for the young saplings. Every quarterly, feed the tree with slow-release granular fertiliser to stimulate growth and fruit production. Generally free from serious pests and diseases. However, the stem and bark borers, pod borers and the caterpillars of the leaf feeds Polyura hebe can be a problem. For subtropical and temperate regions: Hardiness: USDA Zone 9-11. Parkia speciosa or Twisted Cluster Bean’s flowering and fruiting season takes place between August to October with an observed smaller peak between January to March in its native range. In non-hardy regions, plant it in a large tub (though this may limit the size of the plant) to easily bring indoors to overwinter. Alternatively, grow it in the conservatory or greenhouse with sufficient light. Propagation: Easily propagated by seeds. Alternatively, it can be propagated by stem cuttings and budding. Usage: Parkia speciosa or Stink Bean is mainly grown for food. It produces pods with seeds that are eaten raw, cooked or roasted as a side dish with rice. 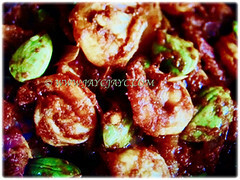 In Malaysia, the fresh green seeds are commonly served with sambal that’s mixed with dried shrimps or fresh prawns and red onions. The seeds have hypoglycemic properties and are traditionally used to lower blood sugar and treat diabetes, kidney disease, oedema, liver failure, colic, expel intestinal worms as well as eaten to expel stomach gas. 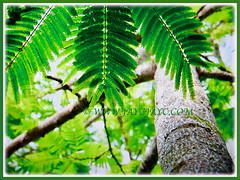 Its leaves are used against jaundice. The timber is fairly heavy but not very hard and durable and can be used for making crates, fishing floats, clogs, matches and disposable chopsticks. It can be grown in a large tub though this may limit the size of the plant.